Foosball allows you to bond with your friends and play football using your hands and eyes only. Hence, you should invest in a quality foosball table. This 2-4 player game will allow you to have a fun and exciting afternoon sessions with them. Now, choosing the right foosball table is more than just the appearance and the size of the table. You should consider the player features it can offer. Allow us to guide you in choosing the best foosball table. Here are the top 10 foosball tables review we’ve prepared for you. Now you can have fun with your friends with this foosball table by EA Sports. The PVC laminate construction assures you it can last for a long time with proper use and maintenance. Also, the chrome-plated metal rods of the foosball table provides extra comfort for the players. The two teams comprise 26 players, all of them are hand-painted. It features the traditional bead scoring system to help you stay on track when playing. This sturdy table can be used for upcoming hundreds of matches thanks to its durability and sturdy construction. The sleek black and red design of the foosball table looks elegant if placed in the right room. 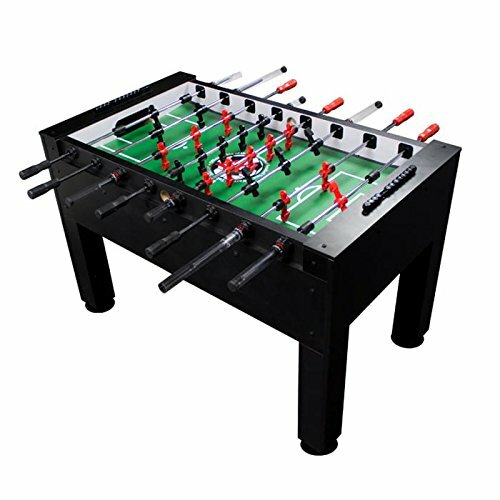 It’s a great item to showcase to your friends who also love playing foosball. Instructions for the assembly are included in the package for an easy reference. Requires more than one person to assemble. This table is recognized by both ITSF and USTSF because of its superior quality and durability. The counter-balanced men and unique rod guard system provide additional safety to the players. Anyone of all ages can play and enjoy this foosball table. It’s also an ideal choice if you are concerned about the safety of your children while playing the game. One can assemble the foosball table with the necessary technical skills and tools. You can install the rods by placing them through the opening and attached bearings. The split bearings it features allow the player to have a more powerful and speedy shot. 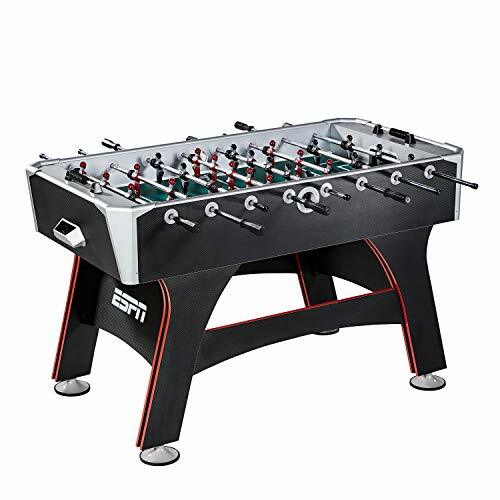 This classic foosball table is complete with 11 counterbalanced black and red men, two pro games balls, extra men, pin punch, and silicone for an advanced game. Issue with fitting the parts. This weatherproof foosball table can be used inside and outside your house. It looks good and also feels good. The nylon bushings will allow you to have a smooth high-speed action. It also reduces the wear and tear of the product. The high-quality laminate construction and weatherproof resin ensure you that this item will last for a long time with proper use and maintenance. The side and corner ramps assure you that the ball is always in action as you play. It features a high stress-resistance steel telescopic rods with anti-rust chromium plating. It’s both sturdy and weatherproof. The unbreakable and quality players are molded on the rods to ensure proper game all throughout. There is a ball pocket on each goal that allows you to retrieve the ball quickly and integrate with the ball as you continue to play. The resin score counters use blue and grey cubes. Takes two hours to assemble. This wooden foosball table is built to last for a long time. The quality engineered wood with impressive finish provides not only a sleek look but also offers durability. The playfield is screen-printed for a realistic feel of the game. It is covered with polyresin that can assure you to last for a long time. The thick solid legs have levelers to ensure the stability of the table while playing. The foosball players are perfect for both starters and advanced foosball players. There are pockets to retrieve the balls quickly and drink holders to allow you to enjoy your drink while playing. The package is packed with all the accessories you will need in a short assembly. 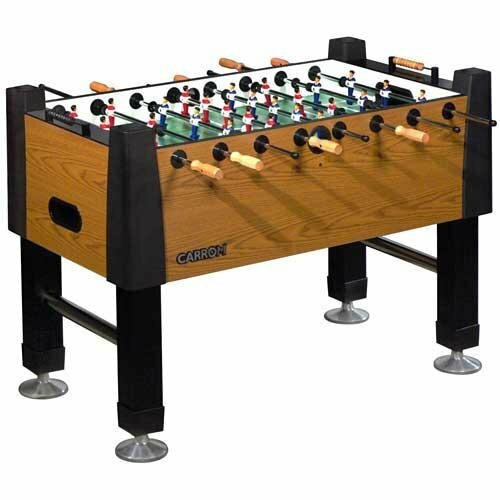 This foosball table is made by French artisans offers a great contemporary look and durability. It is made of dense fiber wood that can withstand wear and tear for many upcoming matches to arrive. It’s chrome-plated to ensure the safety of the players. The steel telescoping rods allows you to have full control when executing quick actions. The round handles and Teflon ring end stop provides additional comfort for you and your friends. The model also features die-cast and hand-painted foosball players. There is a single goalie on each team secured by the rods. The linoleum-covered surface allows the ball to glide smoothly throughout the field. A built-in abacus scoring unit will help you keep track on your game’s progress. The package includes all the parts you need for a short assembly upon delivery. Requires more than two people to assemble. 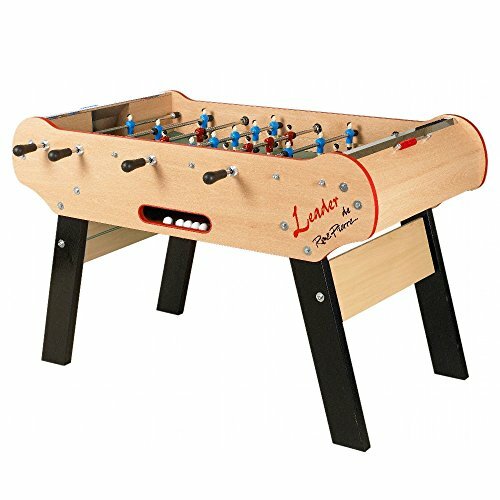 This elegant yet straightforward foosball table is a gift your kids will surely love. The simplistic design of the table is built to last for a long time. It features counterbalanced men set and uniformed men set for a realistic feeling of playing the game. The sturdy leg levelers assure durability while playing the game. 13 red and 13 blue counter weighted foosball men, and you can install two chrome cup holders for a better game. You can lubricate the rod (if requested) to have a smoother action when playing. Board parts of the foosball table are screwed together for added durability. The key pieces are built to last, so you and your friends will have a good time for many years to come. Takes up to three hours to assemble. 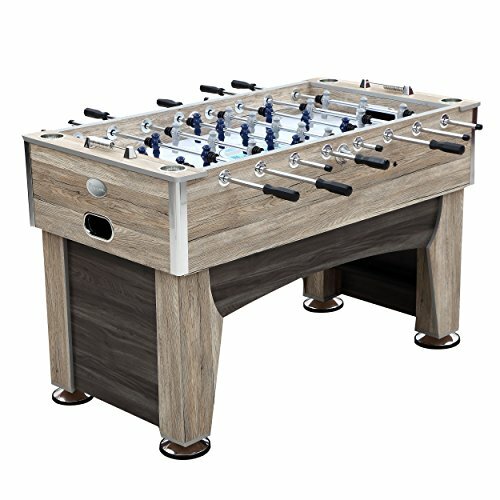 This foosball table is exceptionally durable and elegant. 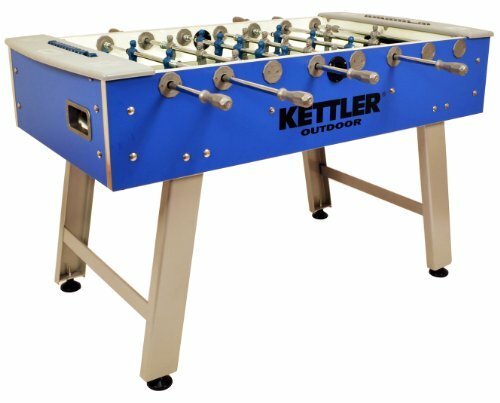 For all foosball enthusiasts, you will surely love the brand quality of this model. The sleek chestnut color of the table makes it a delicate piece of furniture when placed in the right room. Also, the ebony legs of the foosball table emit a grandeur feels. This old-school style foosball table is timeless and can last for an extended period. It features a one-goalie design or three-goalie design, depending on what you prefer. The semi-solid stainless steel chrome plated player rods provides full control while playing. One can quickly retrieve the ball at the end of the table. The slid scoring is also mounted at the end of the table to track the progress of the game. 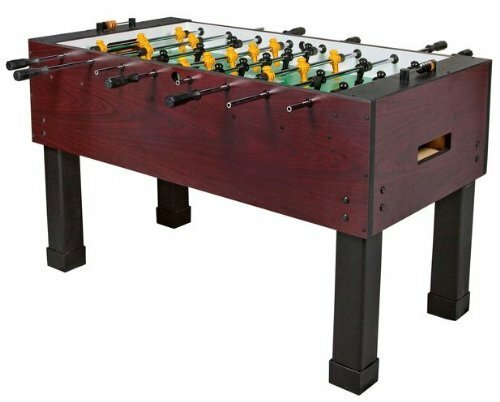 This thick foosball table is adorned with Mahogany melamine finish for an elegant look. The legs are adjustable, and it comes with boot levelers for stability while playing. The SureGrip black plastic handles of the foosball table provide full control to the players when playing the game. This US-made foosball table is built to last and requires little to no maintenance. 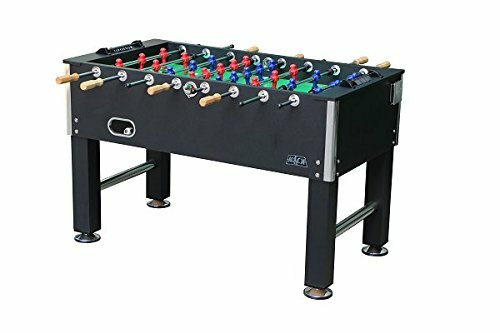 For fun and traditional foosball playing with friends, this product might be the one you are looking for. It is both elegant and sturdy. 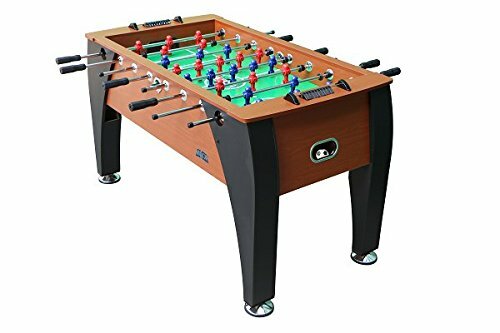 The foosball table can serve you for many years to come and can withstand harsh matches with its quality key pieces and robust rods. This foosball table is built for competitive matches with friends and families. The thick commercial-grade split cabinet that can accommodate the most robust play of foosball in your house is here to bring joy. Its patented rubber bumpers, players, and rods are built to last. Also, the eight-sided molded handle with non-slip surface provides extra comfort while playing the game and full control when in action. 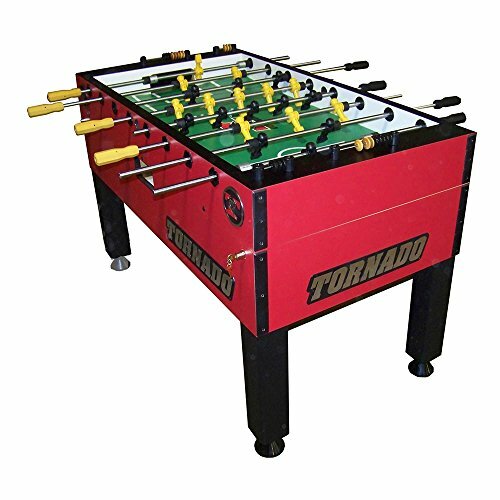 The single-goalie design of the foosball table matches the patented Tornade counterbalanced players. It also features redesigned players foot for more accurate ball control. It has four leg levelers and solid legs for stability while playing the tournament. It’s chrome-plated for added safety for the players, and it comes will all the accessories needed in assembly. Check out this foosball table with 1-inch thick Burr Oak finish that is both elegant and durable. The enamel screen-printed graphics provide a realistic feeling in playing the game. It also features chrome-plated hollow steel rods for full control and added comfort. The 8-sided hardwood handles and premium bearings assure you to have a fast and smooth spinning while playing the game. The traditional wood-beaded scoring system allows you to track the progress of your game while playing. You can choose between one of three man goalie configuration, depending on your personal preference. Built-in cup holders allow you to enjoy your drink while playing the game. Also, the heavy miter-fold black vinyl legs with triple chrome plated leg levelers provide exceptional stability while playing the game.